In a major boost for construction projects in the West Midlands, Sandwell Council and Birmingham City Council have signed a Unite Charter protecting construction workers. The Charter ensures that conditions for workers on construction projects under the councils’ control meet the highest standards. Construction firms planning to work on council building projects will now need to adhere to the new Construction Charter. The Charter commits to working with Unite in order to achieve the highest standards in respect of direct employment status, health & safety, standards of work, apprenticeship training and the implementation of appropriate nationally agreed terms and conditions of employment. Annmarie Kilcline, Unite Regional Secretary for the West Midlands said: “This marks a major boost for construction workers in the West Midlands. Birmingham and Sandwell councils are doing the right thing by signing up to Unite’s Construction Charter. Leader of Birmingham City Council Cllr Ian Ward added: “Birmingham is currently going through an exciting period of construction and regeneration that will shape this city and the lives of our citizens for generations to come. 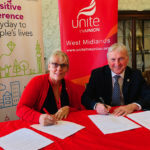 Pictured above are Unite West Midlands Regional Secretary, Annmarie Kilcline and Birmingham City Council Leader, Councillor Ian Ward.